WHAT'S UP THE PIKE: Hillandale Rec Center set to close; East Silver Spring Purple Line focus group TONIGHT (see below). WHOSE PURPLE LINE? Outside last week's Purple Line Now! fundraiser at Montgomery College. There remains a gap between line's eventual riders and its outspoken defenders. If you listen to jazz artist and Silver Spring native Marcus Johnson, public transit might sound like the key to success. "I took the Z2 when I went to Blair, I took the 70 when I went to Howard," said Johnson, emcee of last week's Purple Line Now! 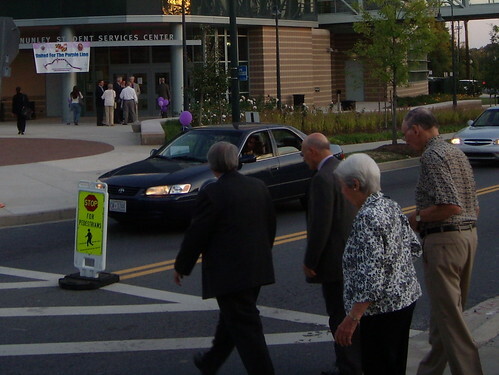 fundraiser, held at Montgomery College in South Silver Spring. "And they opened more opportunities for me than I would've imagined." Johnson may be one of the few bus riders looking forward to the Purple Line, a proposed transitway between New Carrollton and Bethesda. Last week's fundraiser served to illustrate a widening gap between the Purple Line's support base and its eventual riders. "What community speaks for what community?" says County Councilwoman Valerie Ervin (D-Silver Spring), who donated to the fundraiser. "The MTA [Maryland Transit Authority]'s looking at who's using the transit line . . . if you look at who's using [transit] now, it's the poor, the young, blacks and Latinos." Many residents of Langley Park, which may have as many as three Purple Line stops, are barely aware of the project's existence. In communities with high minority populations and heavy transit ridership, awareness of the project is much lower than it is in other neighborhoods. Over a year ago, the Gazette asked people in Langley Park and Takoma Park if they'd heard of the Purple Line, only to discover that most people had no idea what it was. A ride on the J4 Metrobus, which parallels the Purple Line route from College Park to Bethesda, brings you in contact with people as diverse as the places the bus passes through. You'll see line-order cooks and lawyers; schoolkids and secretaries; blacks, whites, Latinos and everyone in between. But that cross-section of commuters - and potential Purple Line riders - was largely absent from last week's Purple Line Now! fundraiser. The crowd that night could have passed for any East County civic association meeting: mostly white, middle-aged and middle-class. "If you look at who shows up representing the community, you don't see a lot of young people," says Ervin, who is black. "I mean, look at this room. We need to broaden the diversity of opinion." To attract more residents, MTA has been holding focus groups in the Silver Spring area this month, including one tonight (7 p.m., Oakview Elementary School, East Silver Spring). Open houses for those uninitiated to the Purple Line will follow in November, according to Mike Madden, the project's director. 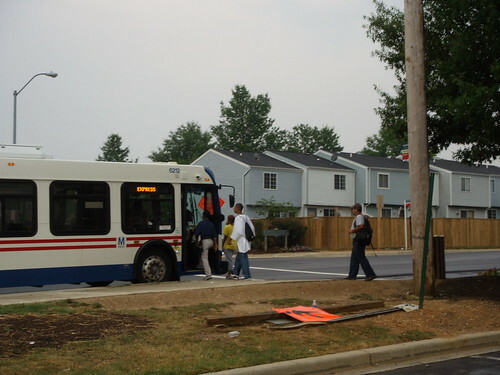 People boarding a bus in the Briggs Chaney neighborhood. Many labor groups, including the transit workers' union - who would benefit from the line's construction and operations - are already aware of the Purple Line, but have become increasingly skeptical of its becoming a reality, according to Jos Williams, head of the Metropolitan Washington AFL-CIO, a labor organization. "Many of our members are beginning to wonder 'is this [the Purple Line] a reality' because there are some very powerful forces opposing the Purple Line," says Williams. "We have to keep them motivated." "Workers in this region who are the backbone of this economy must have an economic way to work," adds Williams. "Workers have to have the Purple Line." Whatever happened to the Purple Line becoming a great commuter route that would reduce traffic on the Beltway? The Purple Line is set to become the DC equivalent of the lawless Baltimore light rail where you cant even sit on a train without being harrassed by a hobo or sitting in a pea-stained seat. You hobos in Silver Spring, yes you Ervin and Leventhal, certainly might see the nostaglia in that but the normal, rational people that live west of Rock Creek think that is a waste of money. They should only build the Silver Spring-New Carrollton part of the trolley and let be the lovely, Capitol Crescent trail where neighbors converse and children sell Lemonade. 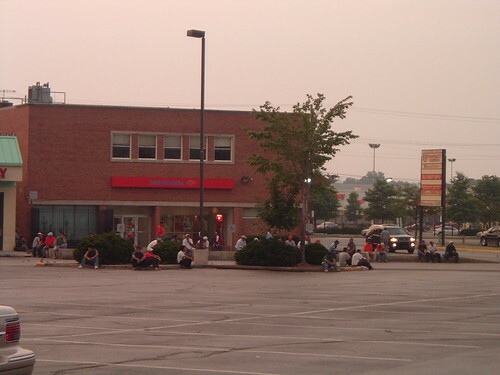 That would kill most of the opposiiton, it would keep the hobos limited to Silver Spring where you hobos appreciate them so much, and it would cost far far less. "but the normal, rational people that live west of Rock Creek think that is a waste of money." I think that you and your Mercedes and BMW's are a waste of money. Hey Dan, this was a fund raiser. The idea behind such an event is to get folks who have a fair amount of money to give it up for a cause. The people who the purple line don't have a whole lot of money, so why would you, or anyone else expect them at a fund raiser? The people at the fundraiser are in the pockets of the developers. The Purple Line is a trumped up boondoggle that will not scale to future needs. The Light Rail will be too slow and will be no more a part of the Metro than is a bus. Unless it is the same price or cheaper than a bus the lower income folks won't use it. The wealthy won't use it if it too slow. It will be a multi-billion dollar system that is mre novelty than function. The Purple Line light rail will be a "White Elephant". It should be called the "White Elephant Line". I am glad to see there is such stong resistance in the community to the trolley. This trolley will damage the environment, people's health and livelyhood, and will increase traffic congestion. Is it really worth destroying the most beautiful and heavily used urban trail in the nation to ram down a trolley through peaceful quiet neighborhoods so that some Bethesda developers get a multibillion dollar increase in their property values. Stop the developers trying to destroy our quality of life using our public money. Montgomery County is like no else in the region, why should we destroy it to become like Arlington where houses are built on top of each other, traffic is gridlocked, and the quality of life is in the dump. Make sure your representatives in the county and state know that the Purple Line is bad for Montgomery County. Can there be any doubt that we need to invest more in mass transit and alternatives to the automobile? I feel like Alice in Wonderland when I read these comments from the hysterical NIMBYs. Brought to you by your friends the Chevy Chase land Company. The Chevy Chase Land Company and a about a dozen other major developers who own virtually every major parcel of land in Downtown Bethesda and around the future stations will get a enormous boost in property values a la you and me. Now Montgomery County, as the single largest landholder in Silver Spring and Bethesda CBD will receive the most benefit. This is why I support this project. Bethesda, Chevy Chase, and most of Silver Spring will receive no increase in home property values. Langley Park and New Carrolton likely might. That is why I don't support this project. I used to live in PG County it was below average then and is a dump now. If you want to live in W. Montgomery County, work hard, save your money, and move there. This whole social justice/equity thing is like Vonnegut's "Harrison Bergeron" with Franchot, Frosh, and Leventhal acting as the Handicapper Generals. If you want Socialism move to Venezuela.